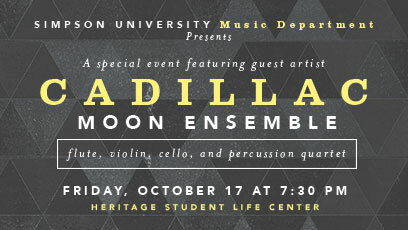 REDDING, Calif. - The Simpson University Music Department is excited to present the Cadillac Moon Ensemble in concert at 7:30 p.m. Oct. 17 in the Heritage Student Life Center on campus, 2211 College View Drive. Tickets are $15 and are available at the door or for purchase online at simpsonu.edu/musicevents. The Cadillac Moon Ensemble (flute, cello, and percussion) is a quartet dedicated to retaining the intimacy and artistry of traditional chamber music while exploring the expansive sonic possibilities presented by its unique instrumentation. Since its formation in 2007, this New York City-based quartet has garnered a reputation for passionate and expressive performances of new music in a wide range of styles. Having commissioned and premiered over 80 works, the Cadillac Moon Ensemble tours across the U.S. and internationally and will be at Simpson University after recent concert performances in the Los Angeles area. For more information, please call (530) 226-4507 or email sumusic@simpsonu.edu.